The Lindsay Park trained filly Nomothaj has been primed for a first assault in Saturday’s $2m Magic Millions 2yo Classic (1200m) at the Gold Coast. Nomothaj, above, is primed for a first up assault for the Magic Millions 2yo Classic at the Gold Coast. Photo by Ultimate Racing Photos. 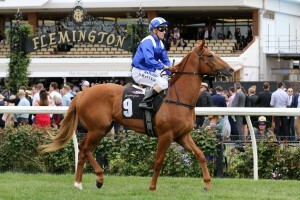 Co-trainer Ben Hayes believes that Nomothaj has the ability to test the two favourites, the unbeaten $4 favourite Ef Troop and the super impressive last start winner Sunlight, the second pick at $4.20 with Ladbrokes.com.au. Nomothaj is the winner of her only race start when she beat Ranier and Sunlight in the Listed $120,000 Maribyrnong Trial Stakes (1000m) at Flemington on October 17 and said that the form looks good with Sunlight winning her last two starts by a combined margin of nine and a quarter lengths. “She beat Sunlight comfortably who has won her past two starts by a cumulative nine lengths. You can’t get any better form than that,” Ben Hayes told the Herald Sun. The Lindsay Park Team of David and Ben Hayes and Tom Dabernig have had Nomothaj in Sydney preparing her for the Magic Millions 2yo Classic before heading to the Gold Coast first up after not having raced since her only race day appearance in the Maribyrnong Trial Stakes. “She won her only start fresh so we decided that would be the best way to approach the race,” Ben Hayes said. Nomothaj will wear the blinkers in the Magic Millions 2yo Classic after carrying them to victory in a 1045m Randwick barrier trial on December 29 with Jason Collett in the saddle. Maribyrnong Trial Stakes winning jockey Stephen Baster will be back aboard Nomothaj in the Magic Millions 2yo Classic and liked the way the filly trialled with the blinkers on. “The other day in her trial in Sydney with blinkers on she looked sensational. She travelled nicely and cantered up to them. She looked like she had improved,” Baster said. Latest betting for the 2018 Magic Millions 2yo Classic at Ladbrokes.com.au: $4 Ef Troop, $4.20 Sunlight, $5 Jonker, $13 Bondi, $17 Meryl, Nomothaj, Secret Lady, $21 Quackerjack, $26 Legislation, Outback Barbie, $34 Anthemoessa, Fullazaboot, $41 Crockett, Witherspoon, $51 Skyray, Terminology, $67 Paquirri, Whiskey Shooter, $201 Veranes.